3 Hail the heaven-born Prince of Peace! Containing biblical phrases from Luke, John, and Paul, the text is a curious mixture of exclamation, exhortation, and theological reflection. The focus shifts rapidly from angels, to us, to nations. The text's strength may not lie so much in any orderly sequence of thought but in its use of Scripture to teach its theology. That teaching surely produces in us a childlike response of faith; we too can sing "Glory to the newborn King!" the Lord has comforted and redeemed us too! that Christ Jesus came into the world to save sinners. In Christ, we are forgiven! Thanks be to God! promising a Savior, guiding all things to their purpose. the eternal Word made flesh. Jesus is the only mediator. Jesus Christ rules over all. salt in a spoiling world. into the world at the time appointed. Christ had to assume them both to save them both together. and birth of Christ benefit you? my sinfulness in which I was conceived. Even now, come into our hearts again. Show us the path of knowledge. Comfort us in our mourning. Save us from our sin. Open wide our way to heaven. Turn our darkness into light. and shout with joy to you, our Lord. Amen. Glory to the King of Kings. George Whitefield changed the first line to "Hark! 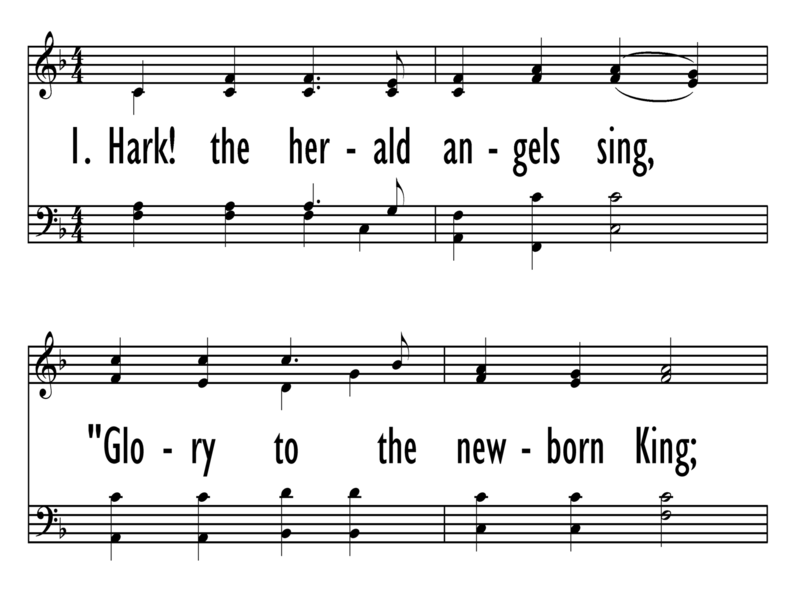 The herald angels sing" and published the text with additional alterations in his Collection (1753). In 1782 the revised opening couplet became repeated as the refrain. The text was extensively changed and shortened by various other eighteenth-century editors as well. This version is essentially the same as the one published in John Kempthorne's Select Portions of Psalms… and Hymns (1810). The tune is from the second chorus of Felix Mendelssohn's Festgesang (Op. 68) for male voices and brass; it was first performed in 1840 at the Gutenberg Festival in Leipzig, a festival celebrating the anniversary of Gutenberg's invention of the printing press. Mendelssohn's tune is similar to another that appeared one hundred years earlier in “The Song of Mars” from the John Pepusch opera Venus and Adonis. Mendelssohn once wrote of this music, "It will never do to sacred words." William H. Cummings may not have been aware of Mendelssohn’s opinion; he adapted the tune to Wesley's text in 1856. 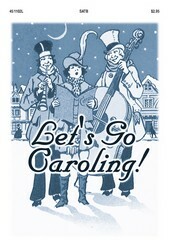 When they were placed together in Hymns Ancient and Modern (1861), "Hark! The Herald Angels Sing" became a very popular hymn. Cummings had a lifelong love of Felix Mendelssohn, sparked when he sang at age sixteen in the first London performance of Elijah, which was directed by Mendelssohn himself. As a young boy, Cummings had been a chorister at St. Paul's Cathedral and later sang in the choirs of the Temple Church, Westminster Abbey, and the Chapel Royal. Cummings became a famous tenor–he sang in oratorios and was especially known for his evangelist role in the Bach passions. He taught voice at the Royal Academy of Music and the Royal Normal College and School for the Blind in London and was also an accomplished organist. Cummings wrote books and articles on music history, wrote a biography of Henry Purcell and edited his music, and composed many choral pieces. MENDELSSOHN is an excellent match for Wesley's text. It is a rousing tune, even martial in some of its phrases. Sing with lots of enthusiasm; do not drown out the stanzas with too much organ–save that extra stop for the refrain and the final stanza. Charles Wesley was ordained a minister in the Church of England in 1735 but found spiritual conditions in the church deplorable. Charles and John served briefly as missionaries to the British colony in Georgia. Enroute they came upon a group of Moravian missionaries, whose spirituality impressed the Wesleys. They returned to England, and, strongly influenced by the ministry of the Moravians, both Charles and John had conversion experiences in 1738 (see more on this below). The brothers began preaching at revival meetings, often outdoors. These meetings were pivotal in the mid-eighteenth-century "Great Awakening" in England. Though neither Charles nor John Wesley ever left the Church of England them­selves, they are the founders of Methodism. Charles wrote some sixty-five hundred hymns, which were published in sixty-four volumes during his lifetime; these include Collection of Psalms and Hymns (1741), Hymns on the Lord's Supper ( 1 745), Hymns and Spiritual Songs (1753), and Collection of Hymns for the Use of the People called Methodists (1780). 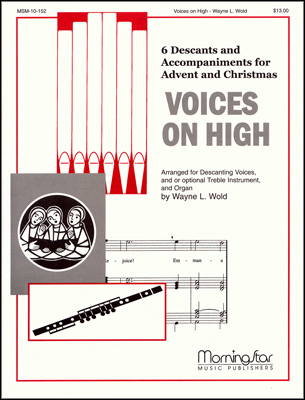 Charles's hymns are famous for their frequent quotations and allusions from the Bible, for their creedal orthodoxy and their subjective expression of Christian living, and for their use of some forty-five different meters, which inspired new hymn tunes in England. Numerous hymn texts by Wesley are standard entries in most modern hymnals; fifteen are included in Lift Up Your Hearts. Charles's elder brother John also studied at Christ Church College, Oxford, and was ordained a priest in the Church of England in 1728. A tutor at Lincoln College in Oxford from 1729 to 1735, Wesley became the leader of the Oxford "Holy Club" mentioned above. After his contact with the Moravian missionaries, Wesley began translating Moravian hymns from German and published his first hymnal, Collection of Psalms and Hymns, in Charleston, South Carolina (1737); this hymnal was the first English hymnal ever published for use in worship. Upon his return to England in 1738 Wesley "felt his heart strangely warmed" at a meeting on Aldersgate Street, London, when Peter Bohler, a Moravian, read from Martin Luther's preface to his commentary on the epistle to the Romans. It was at that meeting that John received the assurance that Christ had truly taken away his sins. That conversion experience (followed a few days later by a similar experience by his brother Charles) led to his becoming the great itinerant evangelist and administrator of the Methodist "societies," which would eventually become the Methodist Church. An Anglican all his life, John Wesley wished to reform the Church of England and regretted the need to found a new denomina­tion. Most of the hymnals he prepared with his brother Charles were intended for Christians in all denominations; their Collection of Hymns for the Use of the People called Methodists (1780) is one of the few specifically so designated. John was not only a great preacher and organizer, he was also a prolific author, editor, and translator. He translat­ed many classic texts, wrote grammars and dictionaries, and edited the works of John Bunyan and Richard Baxter. In hymnody he is best known for his translation of selec­tions from the German hymnals of Johann Cruger ('Jesus, thy boundless love to me"), Freylinghausen, and von Zinzendorf ('Jesus, thy blood and righteousness"), and for his famous "Directions for Singing," which are still printed in Methodist hymnals. Most significant, however, is his well-known strong hand in editing and often strengthening his brother Charles's hymn texts before they copublished them in their numerous hymnals. Felix Mendelssohn-Bartholdy (b. Hamburg, Germany, 1809; d. Leipzig, Germany, 1847) was the son of banker Abraham Mendelssohn and the grandson of philosopher Moses Mendelssohn. His Jewish family became Christian and took the Bartholdy name (name of the estate of Mendelssohn's uncle) when baptized into the Lutheran church. The children all received an excellent musical education. Mendelssohn had his first public performance at the age of nine and by the age of sixteen had written several symphonies. Profoundly influenced by J. S. Bach's music, he conducted a performance of the St. Matthew Passion in 1829 (at age 20!) – the first performance since Bach's death, thus reintroducing Bach to the world. Mendelssohn organized the Domchor in Berlin and founded the Leipzig Conservatory of Music in 1843. Traveling widely, he not only became familiar with various styles of music but also became well known himself in countries other than Germany, especially in England. He left a rich treasury of music: organ and piano works, overtures and incidental music, oratorios (including St. Paul or Elijah and choral works, and symphonies. He harmonized a number of hymn tunes himself, but hymnbook editors also arranged some of his other tunes into hymn tunes. William H. Cummings (b. Sidbury, Devonshire, England, 1831; d. Dulwich, London, England, 1915) had a lifelong love of Felix Mendelssohn, sparked when he sang at age sixteen in the first London performance of Elijah, which was directed by Mendelssohn himself. As a young boy, Cummings had been a chorister at St. Paul's Cathedral and later sang in the choirs of the Temple Church, Westminster Abbey, and the Chapel Royal. Cummings became a famous tenor–he sang in oratorios and was especially known for his evangelist role in the Bach passions. He taught voice at the Royal Academy of Music and the Royal Normal College and School for the Blind in London and was also an accomplished organist. Cummings wrote books and articles on music history, wrote a biography of Henry Purcell and edited his music, and composed many choral pieces.